In this post, I will show you some pretty unique concept. 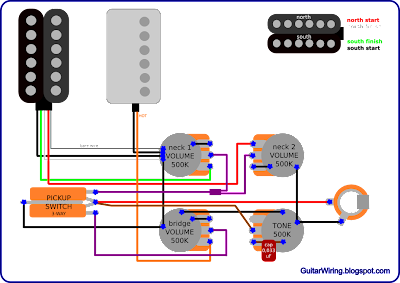 I made a wiring, which can add a little bit of Fender's vibes to your Gibson/Epiphone Les Paul or SG. It will not make your guitar able to sound just like a Stratocaster or a Tele. It's something one of a kind, but it will put in your instrument some cool single-coil based circuit. It sounds really nice in a Gibson-style body. There is the classic „PAF” humbucker on the bridge position. On the neck position, I placed the 4-wire humbucker. The 4-wire humb will not work like a real humbucker in this wiring. Its coils are split. They are connected to the wiring as two different single-coil pickups, with independent volume controls. The single-coil, which is closest to the neck, is connected to the pot by the green wire. The second single-coil pickup has got the red wire. Black and white (grey) pickup wires are going to the ground circuit. The wiring has only one tone control pot - master. It's connected to the wiring by the brown wire. There are three volume control potentiometers. One for every pickup. The pickup selector is made from the common, 3-way Gibson-style switch. If both single-coil volume pots will be turned on, and the pickup switch will be on the rhythm or on the middle position, both singles will be working in the parallel circuit. If you want to turn-off one of these pickups, just turn down one of their volume pots. The tone of Les Paul or SG guitar, with this wiring, will be quite standard on the bridge position. Neck pickups will add to your instrument some single-coil vibes. The character of their connections will make them quite well balanced, not too harsh - not too dark. It also depends on the pickup model.